Amnesty International has issued a new report saying pollution has created a "human rights tragedy" in Nigeria's Niger Delta. The report examines oil spills, gas flaring and waste dumping by the oil industry and centers on the operations of Shell. Marleen van Ruijven, co-author of Amnesty's report, spoke to VOA from Amsterdam, about the findings. "What we find…is that there are violations to the right to an adequate standard of living, including the right to food and… water…violation of the right to gain a living through work…violation of the right to health," she says. She says there's an absence of "any adequate monitoring of the human rights impact of oil related pollution, failure to provide affected communities with adequate information or ensure consultation on the impact of oil operations." "The government is primarily responsible under international law to protect the human rights of their people. The government is responsible for robust oversight of the oil and gas industry," she says. However, Amnesty says the government also has a financial stake in the operations. "The government is…a major stakeholder within the joint ventures. So we see a conflict of interest. And we have to conclude there is no independent oversight of the oil and gas industry," she says. Also, Amnesty says government agencies assigned to oversight lack adequate "capacity and resources" to do the job. An Amnesty team, along with local ngos and Nigerian ex-pats, collected data on the delta in March and April of last year for the current report. Van Ruijven was among them. "What we saw was that people were getting very frustrated because there is now a half a century of oil pollution by companies that really has a devastating effect on the human rights of thousands, if not millions, of people in the Niger Delta," she says. "People…told us their fish catch is very small, that the fish has a bad smell…like petrol. We heard of women who have to cook their cassava double times (twice) in order to get the brownish color away. It used to be white," she says. Fishers say they have lost their nets in oil spills and do not have the money to buy new ones. Amnesty recommends the first step is to clean-up the Niger Delta, estimating environmental damage at $20 billion. "The government has to establish an independent and robust oversight mechanism with clear responsibilities and which operates fully independent of the oil industry," she says. She says this is vital in the investigation of oil spills in the delta. "We think the Nigerian government should make it mandatory for all the oil companies to execute a human rights impact analysis," she says. 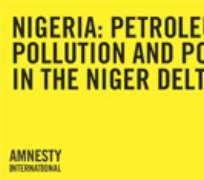 Amnesty says it will present its report Wednesday (7/1) to the Peter Voster, the new CEO of Royal Dutch Shell. It's asking that Shell "come clean" and release what it calls "critical information" on its operations in Nigeria. It's asking Voster, in his first 100 days in office, to address pollution issues. In the past, the Nigerian government has responded to similar criticism by saying it is doing everything it can to clean up the environment. It says it has given a deadline to oil companies to stop gas flaring and that the companies are responsible for cleaning up any spills. The delta has been the scene of much violence, with various armed groups attacking oil industry installations and kidnapping workers. The government, after launching a new offensive against the militias, recently unveiled an amnesty program for those who lay down their arms.